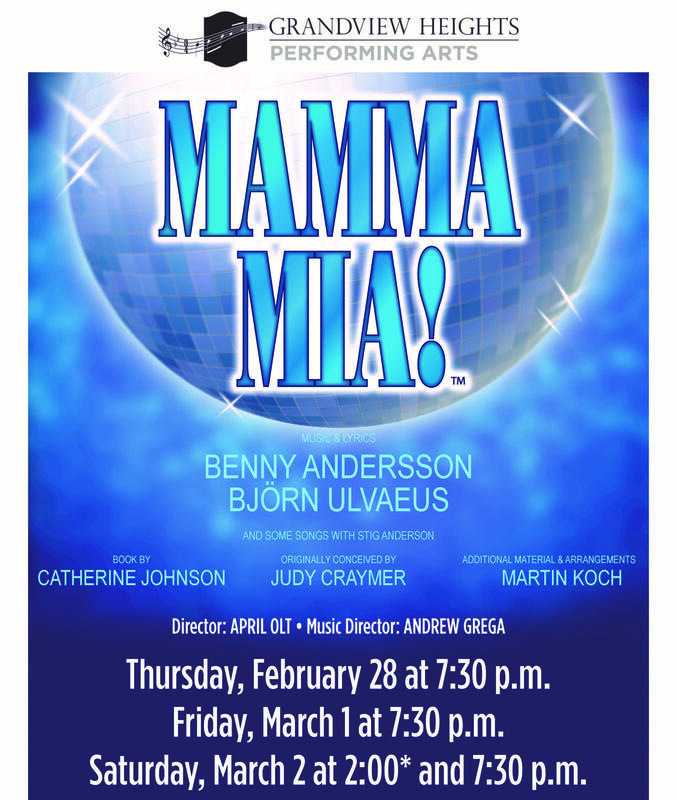 Grandview Heights High School is proud to present Mamma Mia! directed by April Olt with music directed by Andrew Grega and choreography by Megan Overly on Thursday, February 28, and Friday and Saturday, March 1-2, in the Grandview Heights High School Auditorium located at 1587 West Third Avenue, Columbus. ABBA's hits tell the hilarious story of a young woman's search for her birth father. On the eve of her wedding, a daughter's quest to discover the identity of her father brings three men from her mother's past back to the island they last visited 20 years ago. The story-telling magic of ABBA's timeless songs propels this enchanting tale of love, laughter, and friendship--creating an unforgettable show. A mother. A daughter. Three possible dads. And a trip down the aisle you'll never forget! Due to adult situations/innuendos, this show is rated PG-13. Mamma Mia! cast includes: Aria Cadeau as Donna, Ellie Kahle as Sophie, Sally Hofmans-Currie as Tanya, Mary Beth Kauffman as Rosie, Aidan Young as Sam, Spencer Browning as Bill, Daniel Field as Harry, Sam Carter as Sky, Sela Simmons as Lisa, Cassidy Ritchie as Ali , Alan Andrew as Pepper, Nate Pommering as Eddie, Bryan Gilleland as Father Alexandrios. Tickets are still available for all performances. You can also purchase tickets with cash only at the door one hour prior to the performance. 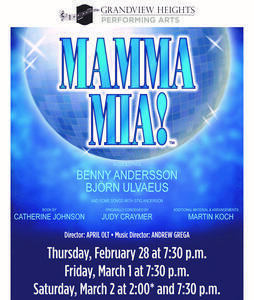 More information about the production is available on the Performing Arts page at www.ghcsd.org. This performance is presented through special arrangement with Music Theatre International (MTI); music and lyrics by Benny Andersson and Björn Ulvaeus (and some songs by Stig Anderson); book by Catherine Johnson; and originally conceived by Judy Craymer.